Around the world, digital technologies are demonstrating their ability to empower educators in their mission of developing the next generation of lifelong learners, innovators, and global citizens. With an effective technology foundation and the right support, teachers gain powerful tools to deepen, accelerate,... and enhance student learning. Students can research, create, communicate, and collaborate in ways that better prepare them for the world, the workforce, or higher education. School systems can base critical planning decisions on a deep, evidence-based understanding of how to improve learning and teaching. Educational technology initiatives also bring risks, however. Achieving the promise of technology requires more than simply deploying devices. If initiatives focus too much on technology and not enough on compelling usages that improve learning and teaching, the results will be disappointing. Transformative initiatives result from holistic efforts that bring about changes in professional learning, curricular planning, assessment and evaluation, policy frameworks, and more. Poorly planned initiatives can waste time and money, widen inequity, expose private data, reduce confidence in the education system, and delay the potential benefits. Even well-designed initiatives can fall apart if they depend on a single charismatic leader who moves on, or if funding evaporates. 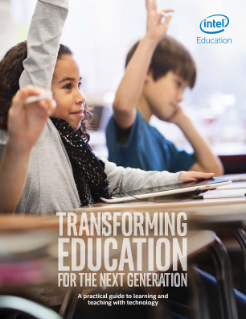 Read the full Transforming Education for the Next Generation Guide.